Restaurants in La Cala de Mijas. 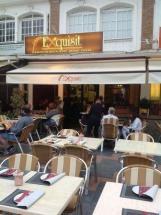 Exquisit Restaurant is one of the best Steakhouse Restaurants in Mijas Costa. We take great pride in our Speciality Steak Dishes, and we also serve various Succulent Pasta Dishes, as well as a variety of great Pizzas. If you are looking for a very special Steakhouse in Mijas Costa then please choose to dine out in La Cala de Mijas at our Exquisit Restaurant. We had a fabulous meal here recently and the Steak was done to perfection, and the flavour was something else, just loved it. Hi Guys,, we dined here last September and we have to say what a place, the Steaks we had were spot on and cooked exactly how we like it medium rare, the kids had Pizzas and they were happy too, so all in all a great place to dine out in La Cala, highly recommended to all.